The price of that loaf of bread or pound of pork chops could be on its way up, as grain prices in the U.S. continue to climb sharply. What's to blame for higher food prices? A shortfall in supply and burgeoning demand, according to a new USDA study. Weather has played a big part in contracting the world grain supply. Thanks to flooding in early summer and dry weather later in the U.S. grain belt, the nation's 2010 corn yield was down 5% from its all-time high in 2009. Soybeans were down 1% and wheat declined slightly as well. All three yields fell far short of the government's earlier projections. The news from other grain producing countries is not helping the situation. Russia's drought diminished its wheat crop. Argentina, Canada and Australia also suffered, or are about to suffer, unusual weather that hurts crop production and adds to the tight world market. Demand is another factor. Darren Hudson, Director of the Cotton Economics Research Institute at Texas Tech, told WalletPop the new affluence in China has come with an increased demand for grains, particularly soybeans. Also, developing nations continue to consume increasing amounts of grain, and "just small increases in per capita consumption means large increases in overall demand." As gasoline prices continue to climb, Hudson points out that "corn is driven largely (but not completely) by biofuel policy." The USDA estimates almost five billion bushels of corn will go into making ethanol this year. Hudson said that the weakening dollar has also contributed to higher prices, as has an influx of investors looking for a better return on their investments. To keep supply and demand in balance, a buffer supply of these grains exists, but this supply is threatened. 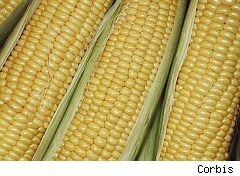 The corn buffer, for example, was one billion bushels in 2009, but will shrink to less than 750 million bushels this year. This represents less than 6% of the world's annual corn consumption. What could be the impact of all of this on your grocery bill? The grain part of most food products represents only a small fraction of its overall cost, but that grain plays a roll in many of the foods you eat, including meat. Hudson believes that "we are on an upward trend line over the long run." In the short term, however, he says that we have the capacity to increase production, and technological advances should raise productivity. The "best cure for high prices is high prices," he states, as better prices inspire farmers to plant more acres and increase yield. Until these new crops can come to harvest, though, Hudson believes that food prices are likely to rise, first in goods less processed, such as fresh corn, and later in foods that use grain, such as meat. Keep your fingers crossed for a good 2011 growing season. The best way to drive down grocery prices is to increase supply.